For the last two years, protestors have marched under the banner of the March Against Monsanto (MAM) in coordinated demonstrations around the world in opposition to genetically engineered crops, the companies that make them or market them, and governments that approve their sale. Thousands of people have participated. While many protestors may have good intentions, hoping to improve the food system, the organizers of the March Against Monsanto and many prominent NGOs that promote this event often misrepresent biotechnology and farming. 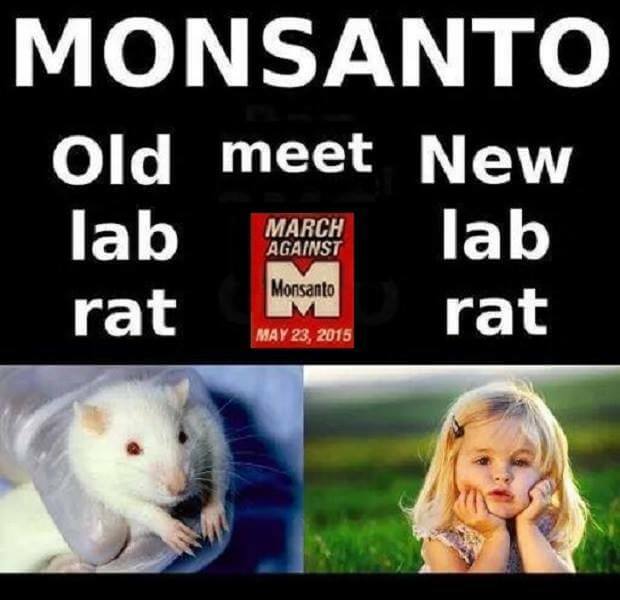 It’s time to take back the science; it’s time to march against the March Against Monsanto. 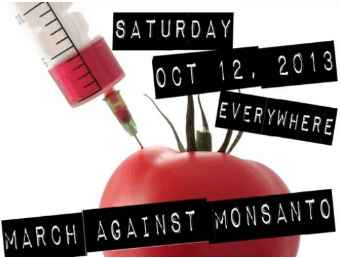 In this spirit, Karl Haro von Mogel, David Sutherland and Kavin Senapathy are planning a counter protest to take place on May 23, 2015—the same day as this year’s March Against Monsanto. Karl is a research geneticist based in Madison, Wisconsin, active science communicator and public speaker. He spends much of his free time helping people understand the complicated science of GMOs. David is a Chicago-based artist by profession, vegan & animal rights activist in his free time. As part of his early activism he contributed efforts to anti-GMO activism. With a discovered interest in science and critical thinking he had a change of heart and mind. Now he has a mission and passion to undo those wrongs by demystifying the issues surrounding GMOs and biotech. Kavin is a freelance writer, science communicator, and mother of two young children based in Madison, Wisconsin. She promotes the idea that critical thinking is key in raising well-rounded children, and that embracing biotechnology is imperative in this objective. While all three come from diverse walks of life, they have united in this movement to promote evidence-based information about our food system, and combat fear-mongering about the same. The idea for the counter demonstration, originally conceived as a symbolic event in Chicago or Madison, has grown into a coordinated movement, with people around the world organizing events to coincide with and challenge the March Against Monsanto. Currently, the movement convenes on a public Facebook page, here. Issues surrounding food incite passion. Food intersects everything from culture to science, politics, land use, nutrition, genetics and history. But because food is so important to human well-being, it is crucial that the claims made about it be carefully scrutinized. The MAM organizers don’t do that. The organization’s mission statement is a collection of false claims and conspiratorial leanings, and the group actively encourages extremist dialogue. 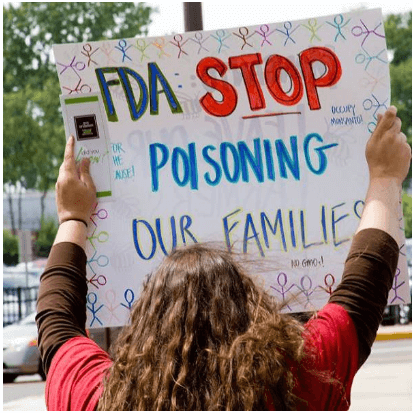 Instead of saving people from poison, it is poisoning the debate about our food. We believe that these claims corrupt the debate and sidetrack the political will of concerned people who want meaningful changes to our food system. There are real problems with our food and distribution system. Inventing fictitious problems, or grossly exaggerating minor ones, or claiming that problems that affect all agriculture are unique to genetic engineering, has no place in a fair-minded public discussion. Obesity, malnutrition, lack of access to healthy food, poverty, environmental challenges and climate change are genuine concerns surrounding food. Misrepresenting science and scapegoating a single company, in this case Monsanto, as the root of all of these problems is not only wrong, but will make it harder for genuinely concerned citizens to address these real issues. This is why we are taking to the streets ourselves, starting a new movement centered around educating the public about the facts about genetically engineered crops, real issues with food and agriculture and civil discussion. 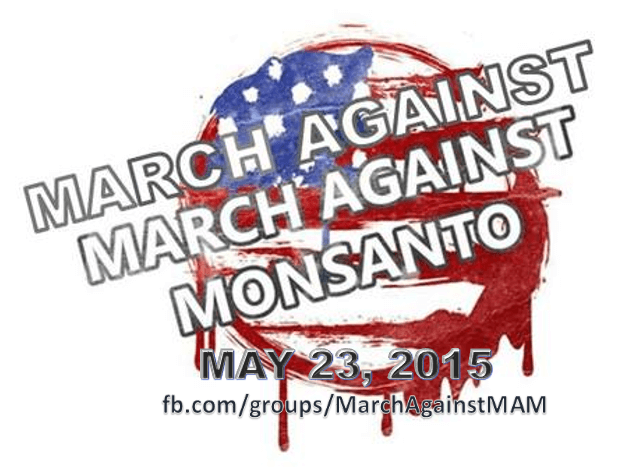 It’s time to oppose the fear-mongering and distortions promulgated by the March Against Monsanto. Global food security and the health of our food system are serious issues. Let’s rally to restore sanity, science and compassion. Messages of MAM are confused, misleading, and wrong. Most of the marchers are concerned citizens, with a belief that they are marching for justice, marching for public well-being, marching against the specter of Corporate Greed. With hearts in the right places and emotions running high, they take to their annual protest. 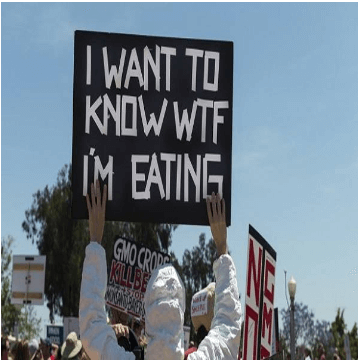 Yet, rather than providing an accurate and coherent message, the March Against Monsanto is an annual spectacle of absurd claims, often represented by scare slogans and signs. 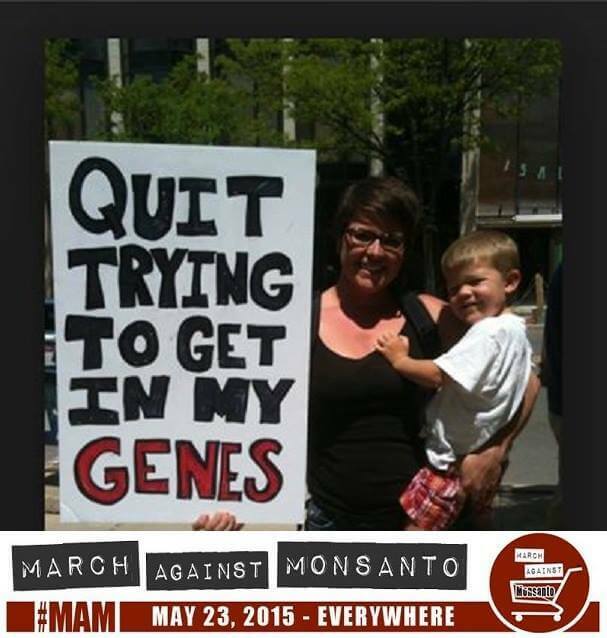 MAM uses images of children supposedly subject to imminent danger from consuming GM foods to play on the emotions of concerned, but scientifically ill-educated parents.This type of imagery is is representative of the irrational “genetic engineering will control you” rhetoric rampant at these marches. Meaningless slogans like “My DNA is not for sale,” and “Quit trying to get in my genes” are catchy and invoke Orwellian-like Big Brother fears of malicious corporate bigwigs using genetic engineering to control the masses. While utterly unrealistic in a scientific sense, the vague allegation that Big Biotech can indirectly control the public via its genes has become a rallying cry at MAM events. The repeated comparison of consumers to lab rats and science experiments has firmly cemented the notion that Big Ag unleashes products without regard to whether they are safe. 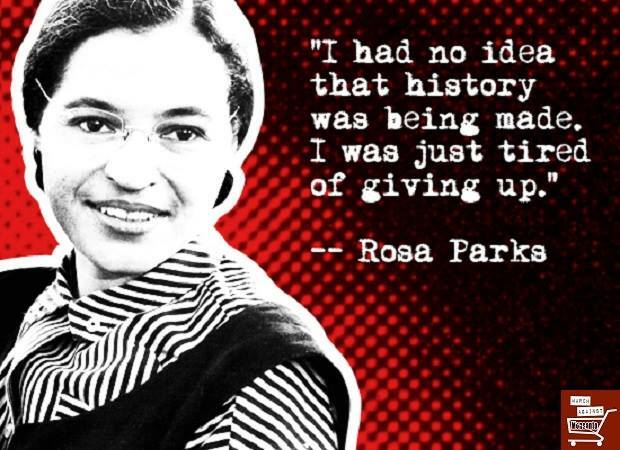 MAM frequently invokes heroes of the American Civil Rights movement, when there is no attack on civil rights taking place. In recent Facebook posts, MAM has used images of national heroes like Martin Luther King, Jr., and Rosa Parks to push its agenda. Quoting these leaders, MAM attempts to compare its movement to iconic and ongoing efforts to grant equal rights to all humans. Nevertheless, MAM’s effort only serves as an insult. Co-opting social justice heroes is a deceitful tactic that is offensive to victims of true civil rights abuses. Related article: Could organic farming's benefit of biodiversity complement conventional fields? MAM leaders sow seeds of distrust about government and science. Not only do leaders paint the picture of Malevolent Monsanto, and Bad Big Ag, they also paint the government as conspiratorial cronies with an underhanded motivation to forgo public safety. It’s a reckless anarchism, drawing on tactics of the far right, that feeds cynicism. Those who use these tactics should be held accountable. The weight of evidence shows that the GMOs that people eat are safe. Just last week, in a survey of the scientist-members of the American Association for the Advancement of Science, the largest independent science organization in the world, 88 percent said GM foods are safe—a consensus higher than that for the belief that humans are mostly responsible for climate change. We see the environmental and health advantages GM products provide, and we are excited about the promise these innovations hold—if the kind of hysteria and fear generated by groups like MAM don’t scuttle that. Technologies like recombinant DNA techniques, gene editing and RNAi have the potential to become an important tool in the challenge to feed the Earth’s growing population and combat malnutrition in increasingly sustainable ways. While biotechnology comes across as daunting to many people, we believe scientists and savvy citizens can come together to help demystify them and inform fellow concerned citizens about how “genetic enhancement” has helped shape agriculture as we know it for thousands of years. Scientists and lay people alike have banded together on social media to spread awareness of the benefits of GMOs. Why not take this momentum a step further, to establish an organized movement? Fringe activists like the leaders of March Against Monsanto spread unscientific propaganda, promote distrust of scientific consensus, use junk rhetoric, and leverage fear. Conversely, we hope to leverage the public’s thirst for reason and knowledge to showcase the potential of GMOs to alleviate hunger and promote sustainability. While fringe anti-GMO activists play on consumer ignorance using scary, fallacious imagery like syringes in tomatoes, we’re convinced the majority of the public is intelligent, albeit misinformed, and eager for an objective view of food, farming and biotechnology. The weight of scientific evidence shows that GMOs are safe and beneficial. With reasonable public policies in place, biotechnology has the potential to help feed and nourish the world. We oppose the fallacies propagated by March Against Monsanto and other biotech activist opponents. For too long, extremist advocacy groups have used the specter of “Monsanto” as a scapegoat to oppose GMOs and attack biotech supporters. Ill-informed opponents of GMOs have manipulated the public discussion and the political process by flooding the internet and media with misinformation. The growing chasm between the pro-science and anti-biotech camps does not promote solutions to global hunger and sustainability. An eye for an eye makes the whole world blind. Biotech fears have harmful, real-world consequences. GM technologies are not a homogenous product to be demonized, but a toolbox to be utilized to improve our current food system. Call and write food companies and organizations that have kept GMO ingredients in their products to thank them for standing with science. Call and write companies that may be debating whether to go GMO free to to encourage them to keep GM ingredients. Educate friends and family about the science and benefits of GMOs in a non confrontational way. Encourage people to get involved, learn and be a part of the conversation about GMOs and food. Support businesses, NGOs, and educational organizations that take an evidence-based stance on GMOs. Offer your expertise. If you’re a scientist, farmer, teacher, or industry expert, donate your valuable time to speak at schools and conferences about the real role of biotechnology in agriculture. “Why we march” and “Solutions we advocate” are evolving lists. As our movement grows, we will work together to refine our mission. While our name–“March Against March Against Monsanto”–denotes our opposition to much of what MAM represents, we will communicate a positive and diplomatic message. MAMAM is our acronym, it has more than one meaning; we also fancy ourselves March Against Myths About Modification. Further, MAMAM is not just a one-day event, but a movement. We hope it will resonate with media, soar in cyberspace and stimulate face-to-face conversations. We promote spreading awareness and sharing science-based information in a proactive, non-combative manner. If you’d like to help, head to Facebook to join the movement. If you’re unable to organize or attend a local event this year, we’re also looking for artists and writers willing to help with publicity material, and potential sponsors willing to donate toward the costs of educational handouts and bottles of water for marchers. Remember, we’re still in the infancy of our movement. Please stay tuned to watch us grow and hone our messages!